I love eggs. 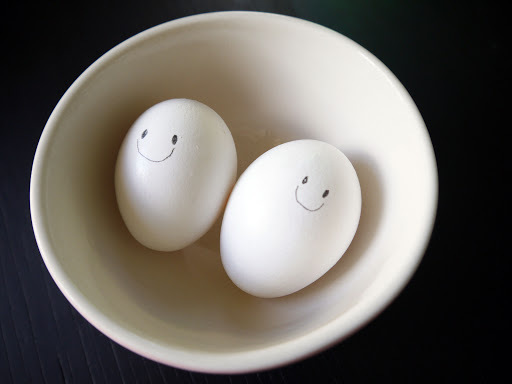 Whenever we’d go out for a long run, Joy would always bring some hard boiled eggs for our post-workout meal. They’re inexpensive and they come in their own packaging. Insert the egg inside the one of the sleeves of a t-shirt and place it right at the center. On both sides of the egg, tie rubber bands or twine to secure it. Hold both ends of the sleeve and start to wind it and then and pull to unwind, spinning the egg. Do this for about 12 times. 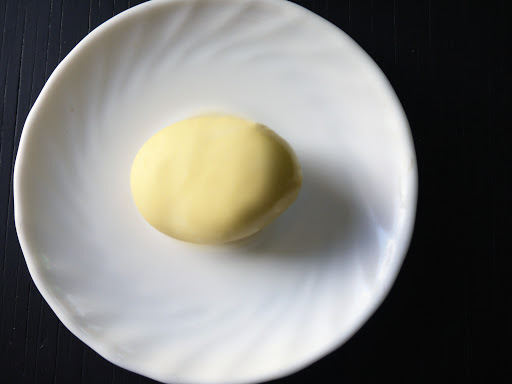 Once cooled, peel off the shell. Instead of putting the egg in a t-shirt, I just held it in my hand and shook it for three minutes. When I peeled off the shell, my heart sank. It was still the same, normal hard-boild egg with an intact yolk. Served me right for not following the instruction! Haha. So I tried it the second time and I followed everything the video said. My obedience was rewarded. After peeling off the shell, I saw a beautiful and perfect golden egg. This is interesting! It will be a nice change, a pleasant surprise for those who will eat it, and also a conversation starter. I'll try this tomorrow. Thanks for posting! I showed this egg to a friend. He asked, “Is it edible?” Of course it is! LOL.